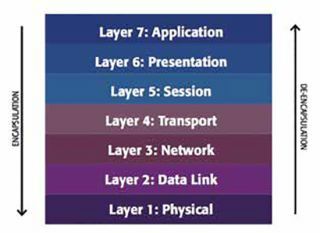 Layer 2 vs Layer 3 Networking: What’s the Big Deal? A networking topology choice that is easily misunderstood. There are many questions that come to mind when selecting a Layer 2 vs Layer 3 network topology for audio systems. Surprisingly, most of it does not have anything to do with the actual layer. For example, how big is the facility? Will the audio data reside on its own network or be on a converged network? How heavily loaded is the converged network expected to be? Will the audio packets be sent point-to-point (unicast) or one to many (multicast)? Is there clock or control data residing on the network and does either of these packet types need to arrive within a given time slot? What is the maximum time the packets can reside on the network and what is the maximum allowable audio latency tolerable for the job. Therefore, I would not consider the layer requirements until this other information is answered. If you study the Open Systems Interconnection (OSI) 7-Layer networking model, you can see the transportation of a data packet resides at the lower level of the table. The big difference between Layer 2 vs Layer 3 has to do with addressing. Better yet, think of it as local addressing vs long distance addressing. Layer 2 networks use what is called a MAC address (which stands for Media Access Control Address) to send data around a local area on a Switch. The MAC address is a local, permanent and unique name for the device—think of it as the floor and room number of your office. The Switch represents the doors and hallways in your office area. Layer 3 networks use Internet Protocol (IP) Address to send information between larger networks using Routers. This information represents you virtual address in the physical world, the same way your mailing address tells a mail carrier how to find you. Instead of using a street address, street name, city, state, and zip code, the IP Address uses these four sets of numbers to narrow down your location in the virtual world. The Router represents you mail carrier as they handle the physical transport of the information. Now that we know the difference between the two layers, what metrics would you choose one over the other comes down to the flexibility of being able to route the packets. Using our addressing examples from above, if you need to send data to the office next to you, use Layer 2. If you need to send the data to other buildings on campus or to a client site, use Layer 3. Scott Kalarchik is an advanced systems engineer in QSC’s system group.